Who doesn’t love pretty indoor flowering plants? Green houseplants are great, but wouldn’t you rather grow colorful indoor plants that bloom all year round? Well then you’re in the right place! In this post, I’ll share my top picks for the best flowering houseplants that anyone can grow! Many types of houseplants with flowers you see at garden centers are sold as gift plants. That’s because some of these plants need special care (and sometimes even a greenhouse environment) in order to rebloom. So most people just toss them out once they’re done flowering. I don’t have a greenhouse, but I love surrounding myself with indoor blooming plants. Over the years, I’ve had great luck growing several different types of flowering houseplants. So I thought I would put together a list of flowering plants to grow indoors that don’t require tons of special care (or a greenhouse!) to get them to bloom. This list is for anyone who wants to enjoy pretty houseplants that bloom all year round without a ton of fuss! Most of these are very easy to care for, and can usually be found at any garden center. 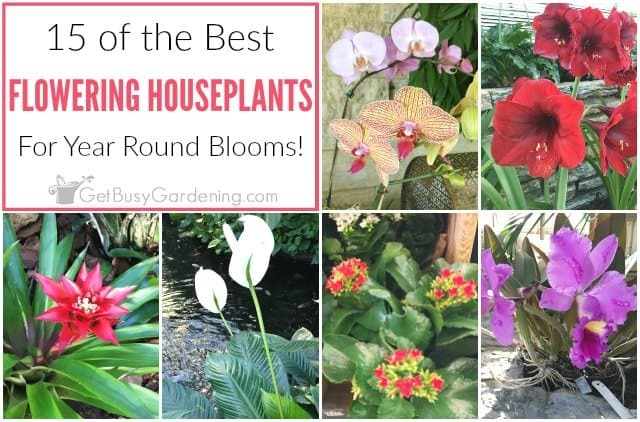 This list of my top picks for the best flowering houseplants has indoor plants that are not only gorgeous when in bloom, but ones that are the easiest for the average indoor gardener to care for and rebloom. 1. 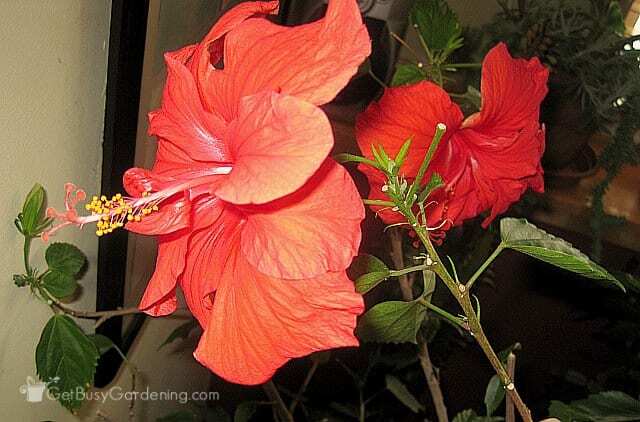 Hibiscus indoor plant – Tropical hibiscus plants make fairly low maintenance houseplants, and they bloom throughout the entire winter near a sunny window in my basement. Though they make good houseplants, in order for them to flower, they do need to be next to a sunny window, or you can use a grow light. 2. Crown of thorns – Crown of thorns are easy to grow houseplants that flower year round. These cool indoor plants are in the euphorbia family, so care for them just like you would care for succulent plants. 3. Amaryllis – A popular holiday gift plant, amaryllis can be kept after the flowers fade, and grown as houseplants. 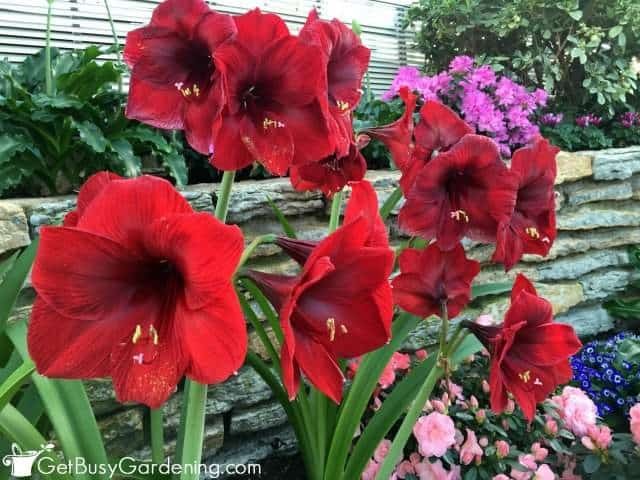 They’re good indoor plants, and given the right conditions your amaryllis flower bulbs will bloom every winter. However, it won’t rebloom without a little help from you. 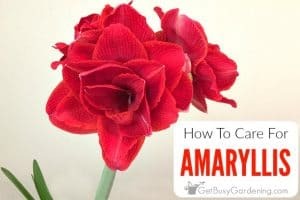 So be sure to follow these instructions to get your amaryllis to rebloom every year. You can learn all about amaryllis plant care here. 4. African violet plants – It’s easy to see why African violets are one of the most popular indoor flowering plants to collect, there are so many cool varieties out there! African violets are easy to grow indoor plants that bloom year round. Plus they’re simple to propagate, and are the perfect flowering houseplants for beginners! 5. Flowering Maple – Flowering maples aren’t considered common indoor plants, and I’m not sure why. They are in the same family as tropical hibiscus plants, and just as easy to care for. Plus they’re unique indoor plants that flower all year long in a sunny window. 6. 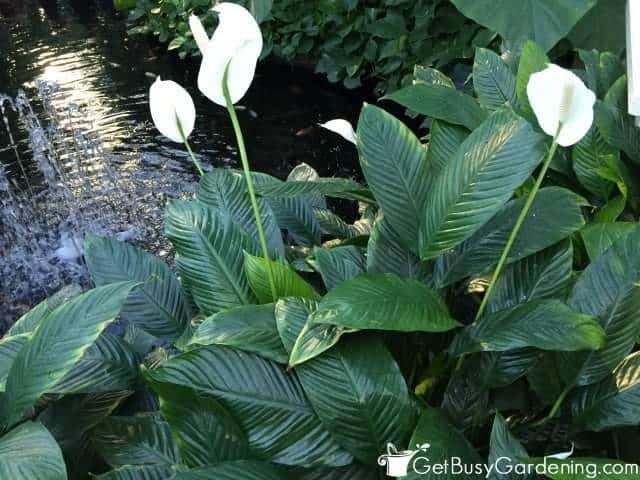 Peace lily houseplant – Maybe the most common houseplants that bloom, peace lilies have a lot going for them. 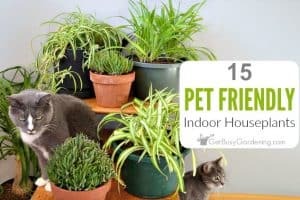 They are one of the best indoor flowering plants for low light, rarely have problems with houseplant pests, will bloom almost constantly under the right conditions, and are even air purifying houseplants! Wow! Learn how to care for peace lilies here. 7. Goldfish plant – This unusual houseplant with small orange flowers gets it’s name because the blooms look like tiny fish. Goldfish plants are beautiful houseplants that flower all year round. This cute little plant is perfect for growing indoors because it doesn’t need a ton of light or humidity to thrive. 8. Lipstick plant – The lipstick plant is one of my favorite flowering indoor houseplants. They look great set atop a pedestal or small side table, or planted in a hanging baskets where these vining houseplants can cascade over the top. They might just be the most beautiful indoor plants ever! Learn all about lipstick plant care here. 9. Bromeliad houseplant – Bromeliads are wonderful tropical indoor plants, and one of the best flowering houseplants for low light. They’re pretty easy houseplants, and really fun to grow too. Water your bromeliad by filling the center vase of leaves, keep the water fresh, and your bromeliad will thrive. 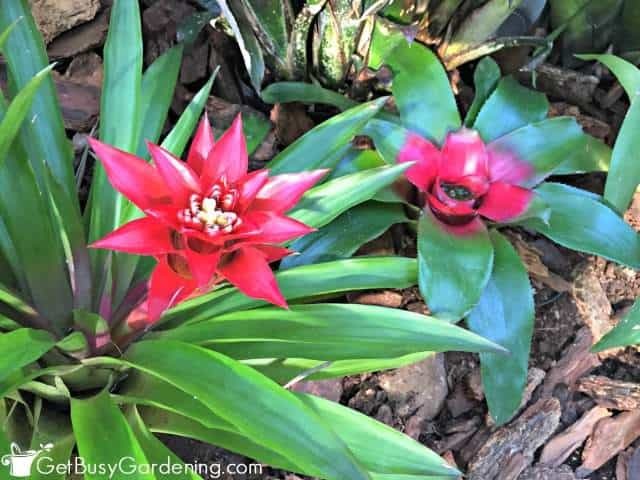 Learn how to care for bromeliads here. 10. Holiday cactus houseplants – Thanksgiving and Christmas cacti are wonderful flowering indoor houseplants that are commonly sold as gift plants around the holidays. That’s because they are cheery winter flowering houseplants, and they’re easy to care for too. Treat them right and they will bloom every year around their respective holiday. Learn more about holiday cacti care here. 11. 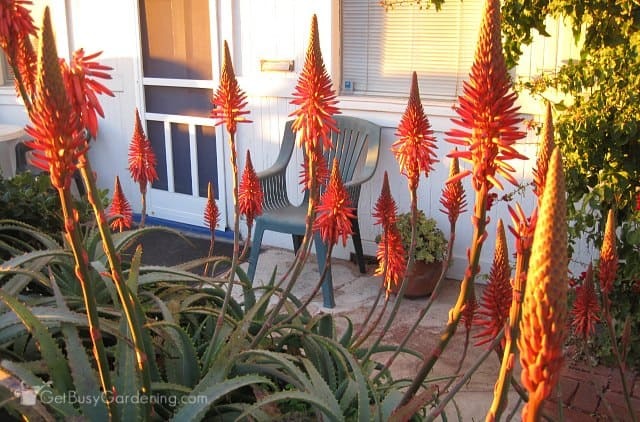 Aloes – There are tons of different types of aloe plants, and some of them are really great indoor flowering plants. Many of them are winter blooming plants, and some varieties flower almost all year round. They’re easy indoor plants to grow too since they’re succulents. Add a few blooming aloes to your collection, and you’re sure to have beautiful flowers all winter long. Learn how to care for aloe houseplants here. 12. Begonia houseplant – Commonly sold as annual flowers in the spring, there are many types of begonia plants that can be brought into the house. Begonias make great flowering indoor houseplants. Many varieties are also very colorful plants with stunning foliage, which is a double bonus! Learn how to grow begonias as houseplants here. 13. Orchid houseplant – There are so many different varieties of orchid plants that you could fill your home with them! Orchids are definitely one of the most common indoor flowering plants, and some varieties are easier to grow than others. If you want to try your hand at growing these pretty indoor plants, start with a variety that is easily found for sale at garden centers, like Phalaenopsis orchids. Learn how to care for indoor orchid plants here. 14. Cyclamen – Another popular gift plant, cyclamens are one of the most popular indoor plants sold in garden centers around the holidays. They’re excellent indoor winter plants that flower for a really long time. The cool thing about this plant is that their growing season is the opposite than most other types of indoor plants. They bloom in the winter and go dormant in the summer. Read all about cyclamen plant care here. 15. Kalanchoe – Many varieties of kalanchoe plants will flower consistently as long as they get enough light. This popular houseplant is notorious for growing leggy when it’s not getting enough sun, so make sure to keep it on a sunny window ledge or use a grow light. 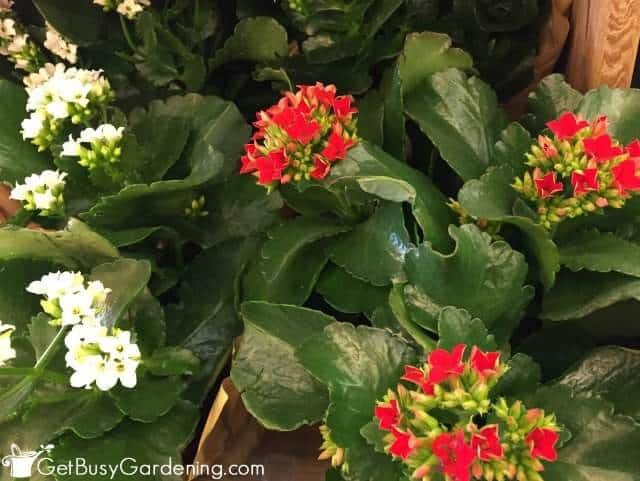 Treat kalanchoe plants just like you would treat your favorite succulent plants, and they will thrive in your home. Caring for houseplants in bloom is a bit different than it is for your basic green indoor plants. Most flowering indoor plants need a little more care in order for them to bloom reliably. Some will need more light and fertilizer than indoor foliage plants. While others are at a greater risk of being infested by bugs, or might be a bit more fussy about watering. Light – Typically, indoor flowering houseplants will need more light than foliage houseplants. That’s because they need to build up extra energy in order to produce flowers. If you don’t have a lot of sunlight in your house, you can use grow lights for indoor plants. Using a small indoor plant grow light plugged into an outlet timer is usually all they need, and doesn’t cost much. Fertilizer – Since they need lots of energy in order to bloom, most flowering indoor plants will need to be fertilized regularly. Organic compost tea or a general houseplant fertilizer will work great in most cases. 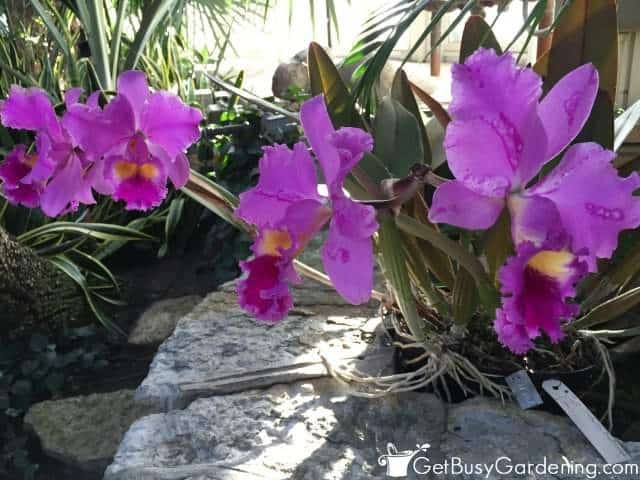 Otherwise you can buy indoor plant fertilizer specifically for the plants you have, like for African violets, for orchids or for hibiscus plants for example. Watering – Some types of indoor flowering plants need to be watered more often than others. Improper watering is the most common cause of houseplant death, and can also have an impact on whether plants bloom or not. So, if you struggle with watering your plants, then I recommend getting an inexpensive houseplant water meter gauge to help you get it just right. Houseplant bugs – Another common problem with growing houseplants indoors is dealing with pests. Some plants are more susceptible to being attacked by bugs than others. 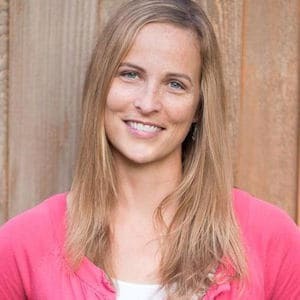 So it’s important to know the signs, and keep a close eye out for pest infestations. Neem oil is a natural pesticide, and works great. You can also use an organic insecticidal soap, or make your own using 1 tsp mild liquid soap to 1 liter of water. Learn all about how to control houseplant pests here. If you’re wondering where to buy indoor houseplants that flower, you should be able to find lots of nice indoor plants for sale at your local garden center, especially during the fall and winter months. You can also find flowering houseplants for sale online year round. 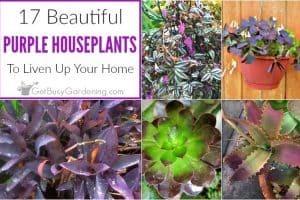 I hope that this easy care flowering houseplants list gave you some great ideas for new plants to add to your indoor plant collection. 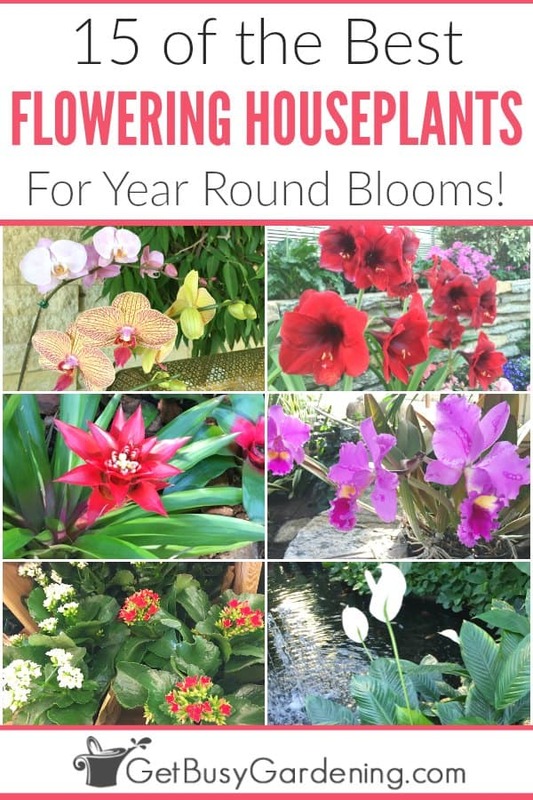 Be sure to buy a few of them so that you can surround yourself with beautiful blooming houseplants all year long! 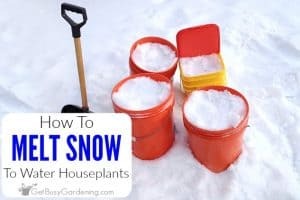 Growing indoor plants during the winter is much harder than it is the rest of the year. If you struggle to keep healthy houseplants through the winter, then my Winter Houseplants Care eBook is exactly what you need! 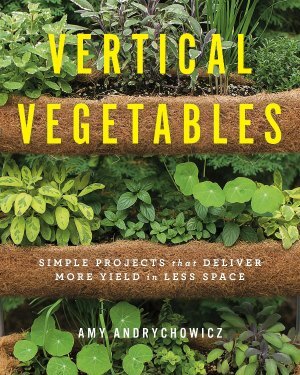 It will teach you everything you need to know about how to grow houseplants and keep them thriving all year round! Download your copy today! Share your picks for the best flowering houseplants in the comments section below.